As per reports on June 2015 of global market share of phone operating system, Android looks to be leading the market with 51.04% market share while iOS is immediately behind with 40.83% global market share. 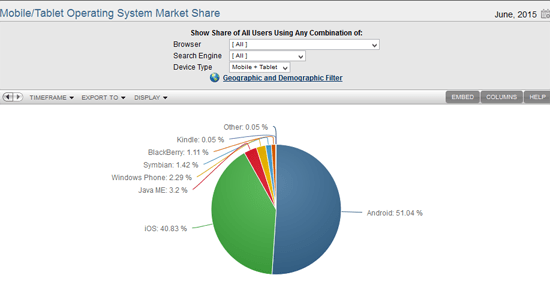 Windows phone is next with 2.29% global market share. As per statistics for the last 11 months, published in NetMarketShare reports, Android market share is slowly moving ahead though with many ups and downs while iOS looks to be retreating a little. As per report ingredients, Android, which is currently occupying 51.04% of the total global phone OS market, has gained the 11.81% ground from 45.01% market share in August 2014 and 51.04% in June 2015. While on the other hand, iOS has lost the market share by 8.59% when it dropped its market share from 44.34% in August 2014 to 40.83% in June 2015. Even in United States, the Android is increasing its phone OS market share where it has strengthened its market position by 11.81% from 45.01% market share in August 2014 to 51.04% in June 2015. On the other hand, iOS OS has dropped its share by 8.59% from 44.34% in August 2014 to 40.83% in June 2015 right in US market, i.e. in its home ground where it still looks to be most popular operating system. Situation is alarming for the Apple as it has to look immediately to the affairs and must try to improve iOS, its flagship operating system, which was once hugely popular, not only in US but in global market as well. Newer How to Choose/Set Desired Focus Mode in Camera in Android 4.4.4 KitKat?